Linda Smith in Toronto’s Music Garden. Linda Smith writes music for dreams, dreams awash with silence. Her music gently prods the ear and takes it on a journey of discovery, each cluster of sounds a garden of delight. Her latest work titled “Rose With Thorns” for harpsichord and violin was serendipitously premiered in Toronto’s Music Garden on August 19. This garden was the idea of cellist Yo-Yo Ma and landscape artist Julie Moir Messervy. The two came up with the idea of a “reflection in landscape of Bach’s Suite No.1 in C major for unaccompanied cello”. When the plan was completed, they took it to Boston Massachusetts in the hopes of finding a place to build it. But the city politicians of Boston vetoed the idea so Yo-Yo and Julie migrated north to a new city and a different country,Toronto, Canada. Here in Toronto, they struck gold. They hooked up with Jim Fleck a former college bass drummer, businessman and political advisor who occupies most of his retirement hours funding important cultural organizations. Yo-Yo had found the right man. Mr. Fleck can make a phone call and people will part with significant sums of money simply by hearing “Hi, this is Jim.” Indeed, he got all the money together in a short afternoon of phone calls from his home. There was only one rejection. The owner of high end condominiums overlooking the slice of land proposed for the garden, refused to contribute even though the garden would add considerably to his property values. It’s been a few years now since the garden was built and it has fleshed out beautifully. Native grasses, lovely shrubs and flowers and trees well on their way to maturity, make this spot if not completely tranquil, at least comforting to one’s eyes and spirit. A decision was made to hold free week end concerts in the garden and Tamara Bernstein was chosen to organize each season’s roster. Tamara is an intelligent musician and a delightfully loquacious communicator. She has done a remarkably good job from the moment she began. Since the first Garden concert, however, problems have developed beyond those normally associated with outdoor performances. The Music Garden exists only a sidewalks’ width from Lake Ontario. Private boats dock all along its length and a bit further out, occasional party boats pass by blaring loud music in their wakes. Porter Airlines and Air Canada launch or receive 150 flights a day from the island airport just a hefty stones throw from the garden and as evening approaches, canons are fired from the waterfront to scare Canadian geese from the airline flight paths. On the other side are sidewalks, roads for automobiles and tracks for streetcars. From that side you get the occasional sound of horns, radios, bicycle bells, macho motorcycle motors and the clackity-clack of Toronto transit. So what does all this extraneous noise portend for a harpsichord violin duo? Surprisingly little. The Music Garden has found a good sound-man who enhances instruments and keeps the music clearly audible against the ambient sounds. The violin harpsichord duo is from Montreal and though young, they have some very impressive things going for them. Les Amusement de la Chambres play a very interesting repertoire, mostly from the Baroque era, and play at an extremely high level of artistry. A commissioning program which regularly supplies them with contemporary works was responsible for Ms Smith’s work. Ms Smith is slim and self effacing. For many years a major interest for her has been Tango dancing and I suspect she is very good at it. She has also become one of Canada’s senior composers. She told the audience that the title of her work came from the Rose, the violin and the plucking of the harpsichord, the Thorn. It is a substantial work, harmonically captivating with many moments of repose which allow one time to reflect and absorb. The Music Garden’s terraced seating was filled with people and the weather was perfect. 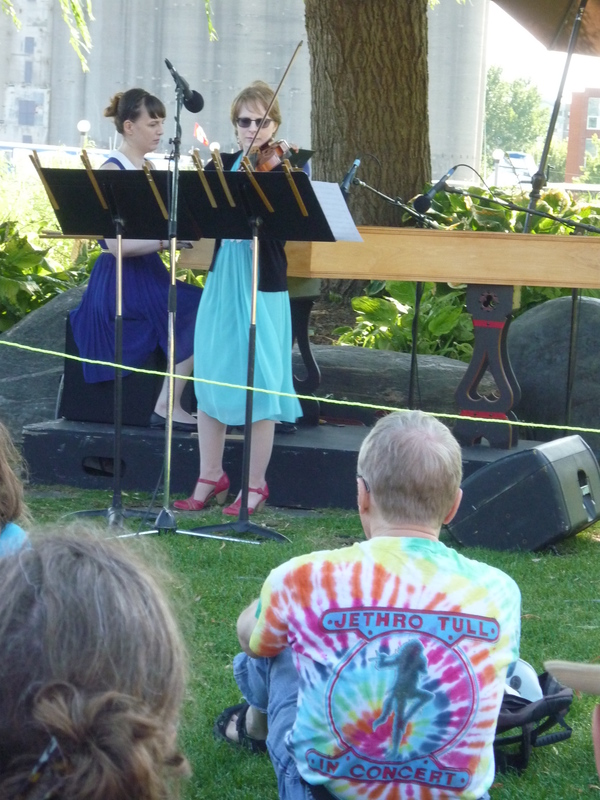 Harpsichordist Katelyn Clark and violinist Emily Redhead successfully contended with freshets of wind and noise. As for Ms Smith’s “Rose With Thorns”, they allowed its sounds to hang unhurried in the air and their performance was a treat for these ears. This duo opens many doors for music exploration and if Les Amusement de la Chambres can stay together, they will have a splendid career. They are already a welcomed addition to the chamber music of Canada. Les Amusements de la Chambre. Photo courtesy Margaret Christl. Yet another good reason to come to Toronto!